Fewer people are shopping at Staples ... and that's showing in the company's weak results. Staples shares plunged more than 10% following a disappointing earnings report Tuesday. Profits for Staples (SPLS) in the first quarter plummeted 43.5% — far short of expectations — and revenue fell 2.8%. The office supply chain's drop is the latest example of the company's struggle to compete against Amazon (AMZN) and other e-commerce giants. "When you're trying to take a company the size of Staples, which had a very strong retail legacy and move it into more of an online company, there's going to be a lot of changes and it's going to be hard to predict exactly when you can get back to historical margins," said CEO Ron Sargent during a conference call following the earnings report. Sargent noted that the number of customers visiting its stores fell slightly, but that online sales were up 6%. Still, he didn't say exactly how much money Staples gets from its online retail site. Staples has been restructuring in a bid to boost profits. Sargent said the company would cut costs by $250 million through the end of the year and $500 million by the end of 2015. Much of those savings will come from closing and shrinking stores. Sixteen stores were shuttered in the first quarter and 120 more planned during 2014. But investors appear to be losing confidence in the turnaround strategy. The number of shares borrowed and held short, a sign that investors think the stock will go down, has doubled over the course of the year. And that's been a smart bet. Staples has lost more than a quarter of its market value this year. 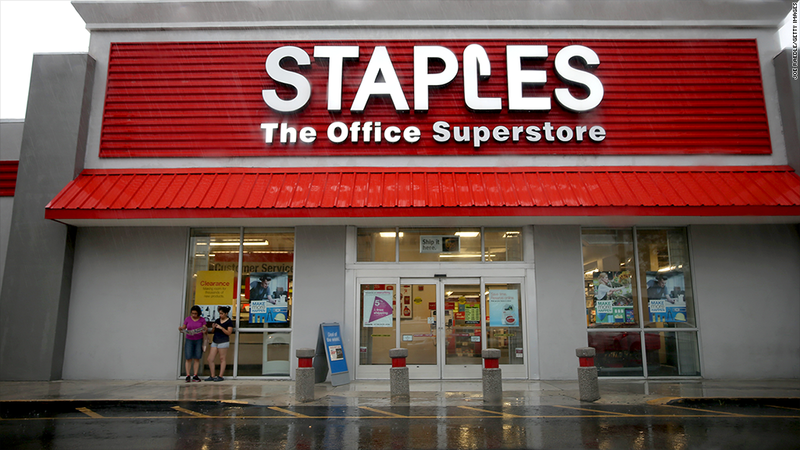 Office Depot (ODP), a major Staples competitor, fell in sympathy with Staples. The stock was down 4% Tuesday.